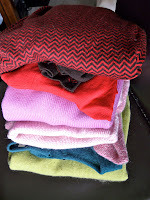 This week was the ARC Thrift Stores' $.99 Sweater sale! So awesome! I arrived on the last day so things were a little picked over, but I managed to find 8 sweaters, two for wearing and the rest are brightly colored woolens for felting! 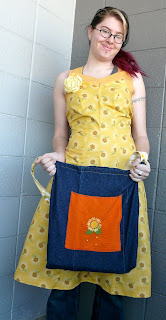 Look for more sweater bags popping up in my store in the coming weeks! That's right, it's time for some more flashback craft disasters! Excessive use of bangles - penalty! 5 Skeins... Really, sequins do not make awkward wearables "elegant". 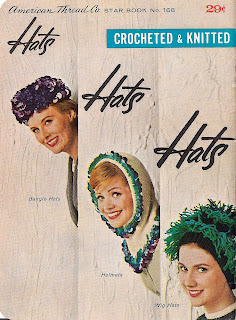 And wig hats? Really? Or how about a shag rug Shriner's fez, too chic... (with pom poms!) 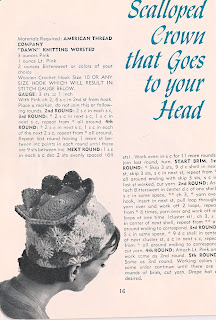 And if you really love a silly hat, then an upside-down crocheted fruit bowl is going to be just your thing! A fuzzy coaster strapped on to your head? Neither Pancakes nor buns are getting tied on to my head thank you very much. 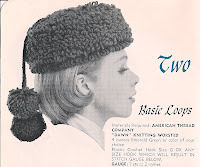 That hat has the distinction of being neither flattering, fashionable, nor functional, a waste of perfectly good yarn! 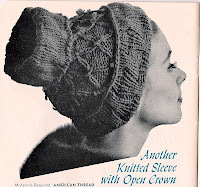 (OK, 1960's acrylics are just barely in the category of perfectly good yarn, but the booklet was published by a wool yarn company!) And last but not least... You remember your very first hat? You weren't sure how to close up the top... so you didn't? Yeah, niether do I. 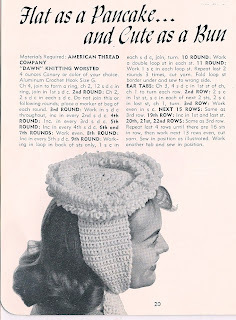 But here is a pattern to show you how to create a hat fail! 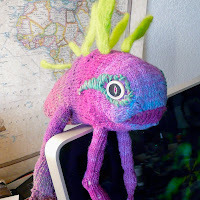 Tho, if you can manage the simple cable stitch then I think you can learn to decrease properly. 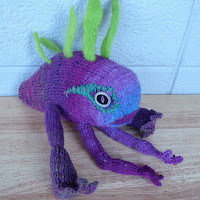 Finished my first Murloc, and the second one is ready for stuffing... They're super cute when they aren't trying to kill you! 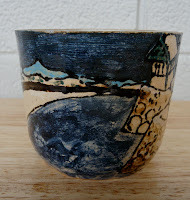 When ever a new set of cups some out of the kiln I get lots of curiosity about "how did you do that? ", so I wanted to post some of the steps involved in making my cups with designs ripped right from classic Japanese images. First I go through my sources and find a lovely simple scene. 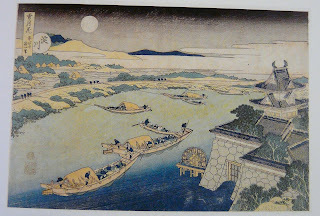 This is one of master printmaker Hokusei's landscapes (He's famous for his views of Mt. Fuji... like the one with the wave). 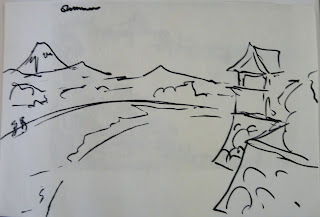 And since I was using some others with Fuji San in them I dropped it into the background on my sketch. It really is that big of a mountain that it can be seen from so many different places. 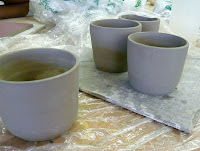 I had already made my cups, trimmed and cleaned up - really ready to be fired for the first time. 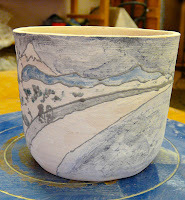 I use a small knitting needle to lightly etch the design in to the clay (which is still wet and slightly soft). 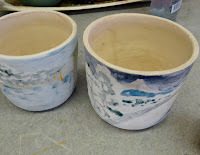 I have to keep the cups wet as I work so that the stains glom on to the clay and don't crack and peel off as they dry. The colors are applied one at a time, just like the original print was made. I even follow the usual order of darkest to lightest. The stains are made from pure mineral based pigment, a little bit of glass based stuff (frit or silica or what have you...) to make the pigment stick, all thinned with water. Applying them is a lot like water colors with a thin layer being somewhat transparent. The colors will layer a bit, with the strongest color coming through. So I have to be careful to leave empty the spaces where the lightest colors will be. Here's all the colors layered down, I put the white on to make it a snow scene. Not every part had color on it, and the blank spots will be the natural color of the clay - a nice creamy gray off-white. 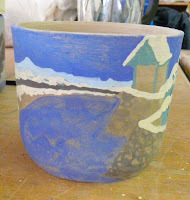 Now the vessel goes in for the first firing (after it's dried of course). 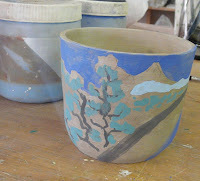 After the first firing its called greenware, and I can apply the final glazes. Mason stains are usually fairly matte, with the areas of heaviest color getting a little bit shiny. I give the outside a very light coat of a satin clear, just enough to seal the clay for foodsafe-ness. The inside gets a nice thick coat of colored glaze. Be sure you glaze the inside first so you can wipe off any drips! Voilá! The kiln spirits shined upon me (12 items, only one cracked!) and this bowl is finished. The black lines are slightly raised and give a nice texture to it. 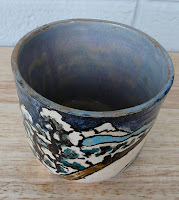 You can see that the brushstrokes in the water came out in the final firing, and the slight difference between the raw clay color and the white mason stain. Well, apparently the weather checked the calendar! 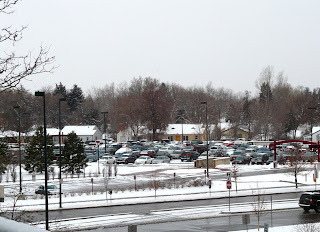 After a few weeks of 60F and sunny the weather gods realized that it's not spring yet, and went back to snowy and overcast. Ah well, Colorado weather is like that! What is this... and can I put it in my food? There is a Japanese saying - "Whenever you try a new food you add seven days to your life". 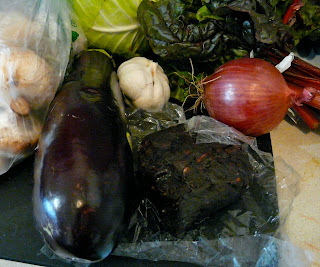 So here's the challenge, go to a grocery which specializes in some ethnic food. Look for something you've never eaten before, perhaps never even heard of! Extra points if the label is unintelligible or poorly translated and you aren't 100% sure what it is. Do this for many many years and you may find you have run short on foods that are new to you, but you can still use them in new ways! On a recent trip to a middle eastern shop I picked up a block of tamarind. In the wild tamarind looks like fat overgrown locust pods, and the flesh around the seeds is what you eat. 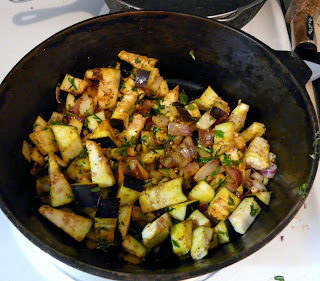 Usually I have tamarind drinks or sweets, but I decided to try for a tamarind curry. Here it is! Several months and three ninja stars later, my epic double knitting project. 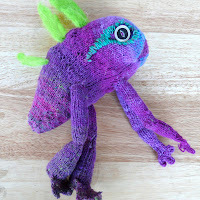 For those who don't know double knitting makes two faces at once that are reversed colors, so the front and back of the scarf are just switched. 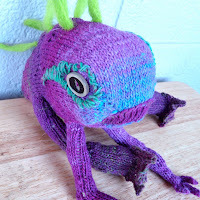 Here's the blog post with the chart if any of you want to embark on your own epic knitting journey. I think I am done with double knitting for a while (tho, this scarf is unbelievably warm!) 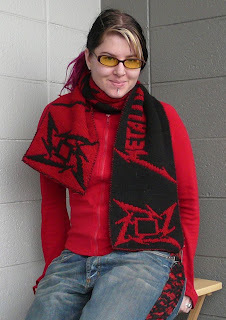 But I may be using the ninja star chart to do some other projects... Metal Knits FTW! Oh, and that is 9 1/2 onces sport wieght brown sheep lanaloft, equal amounts of each color. Two yards long and 9" wide. And Epic! Epic.